Yes, I am posting about our St. Patrick’s Day meal days after St. Patrick’s Day, when it is unlikely that many people are interested in making Irish food. Ah well, that is what happens when I make food for a holiday, and only have the time to blog about it after the fact. 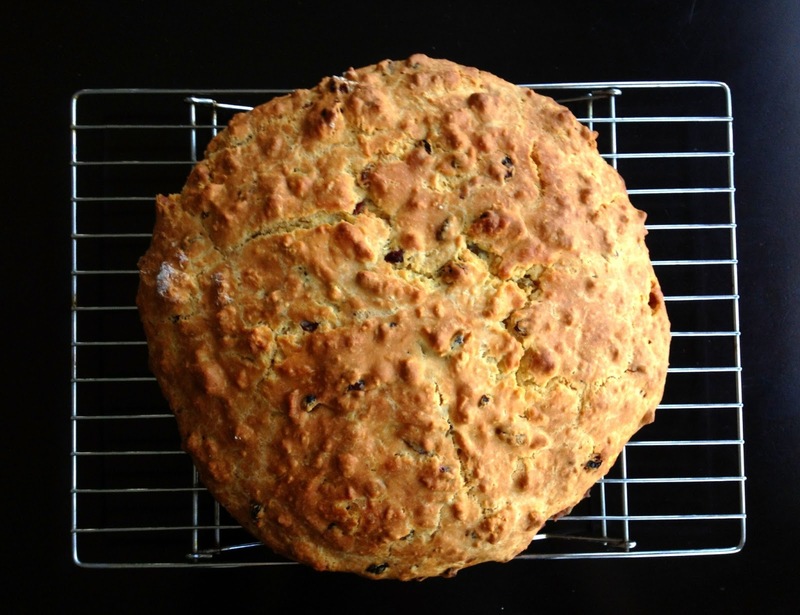 Maybe we can all revisit this post next year, and have a lovely Irish meal all planned out! St. Patrick’s Day is one of my favorite holidays, primarily because it gives our family a chance to celebrate my husband and multiracial kids’ Irish heritage. Over the years, I have fixed several rounds of St. Patrick’s Day meals, and have come to really love each of these dishes. This year, I made baked corned beef (recipe below), sautéed cabbage (recipe below), boiled potatoes with butter and parsley, and cranberry raisin soda bread. Throw in a group of friends, a game of Leprechauns! (completely and ridiculously invented by Steve and me) and a round of Irish Car Bombs, and you have yourself a fabulously fun St. Patrick’s Day party. Preheat oven to 350 degrees. Drain the corned beef from the package and discard the spice packet. Lay corned beef, fat side up, on a large piece of heavy duty, wide, aluminum foil (you may have to get creative with the way you wrap the beef if your foil isn’t wide enough). Insert the cloves into the top of the slab of corned beef, evenly spaced. Spread the top with the hot sweet honey mustard. Sprinkle brown sugar over the top. Wrap the corned beef with foil in a way that allows for a little space on top between the corned beef and the foil, and creates a container to catch the juices. 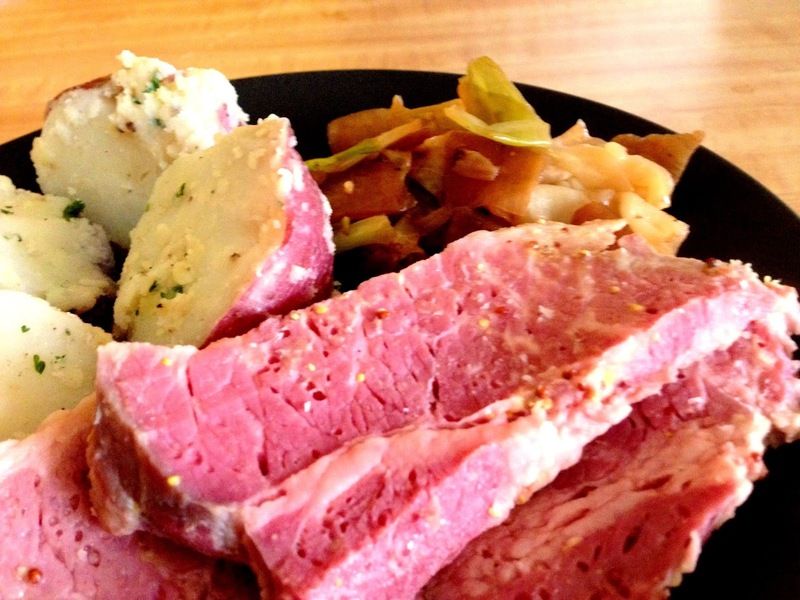 Place foil-wrapped corned beef in a shallow roasting pan and bake for 2 hours. Open the foil wrapping, spread a little more honey mustard over the top of the corned beef, and broil it for 2-3 minutes, until the top is bubbly and lightly browned. Let rest for 5 to 10 minutes, then place on cutting board and cut at a diagonal, across the grain of the meat, into 1/2-inch thick slices. Serve immediately. Heat 2 Tbsp olive oil (enough to well coat the pan) on medium high to high heat in a large, wide pot (8-quart if available) or large, high-sided sauté pan. Add chopped onions, cook for a couple of minutes, then add garlic. Add a third of the sliced cabbage to the pan. Sprinkle with a little salt and stir to coat with oil and mix with onions. Spread out the cabbage evenly over the bottom of the pan and do not stir until it starts to brown. If the heat is high enough, this should happen quickly. The trick is to have the burner hot enough to easily brown the cabbage, but not so hot that it easily burns. When the bottom of the cabbage is nicely browned, use a metal spatula to lift it up and flip it, scraping the browned bits as you go. Once the cabbage in the pan has browned on a couple of flips, add another third of the cabbage to the pan. Mix well, then spread out the cabbage and repeat. You may need to add a bit more olive oil to the pan to help with the browning, and to keep the cabbage from sticking too much to the pan. Once this batch has cooked down a bit and browned, add the remaining third of the cabbage and repeat. Serve with the corned beef. Can be made ahead and reheated.